I laced up my boots and straightened my starched uniform every morning as I left for work before the sun rose above the horizon. I was a Soldier and a combat veteran. But I packed a MESSY secret deep in my cargo pockets. I couldn’t shake the thought of a black sedan with government tags pulling up in front of my town house and dress uniform wearing Soldiers knocking on my door. My heart pounded and my stomach was tied in knots. For months on end, I did everything within my power to be anywhere but home during official notification hours. If your spouse has been deployed in a combat zone, this scenario might sound familiar. But for me, common fear crossed the line into unhealthy anxiety. By the grace of God, my husband came home from that deployment unscathed, but my experience uncovered an uncomfortable truth in my heart. My faith had been tested and found insufficient. I lacked confidence that God would take care of me if something should happen to my husband. I was consumed by fear because my the roots of my faith were shallow. A lack of trust often presents itself as worry, fear, anxiety, discouragement, or a constant desire to fix things our own way. I believed in God and knew that His son was sacrificed for my salvation, but I didn’t have a relationship with Him. Believing in God and trusting Him are not necessarily synonymous. To trust Him, we must know Him – like a Friend, Father, Protector, Sovereign Lord, and Redeemer. To establish a strong relationship with Him we must read His love letters and communicate with Him in prayer. My faith had to be more than an entry on my dog tags. To find peace in troubling times trust God. Instead of being consumed by my earthly needs, I learned to seek God’s Kingdom and then trust Him to provide all that I require for righteousness (Matthew 6:33). In place of fretting I began to pray and give thanks (Philippians 4:6-7) even for the smallest of blessings, acknowledging that all goodness comes from above. Rather than agonizing over the possibility that I would suffer unspeakable pain, I trusted God would never leave nor forsake me (Deuteronomy 31:6) no matter what happened, because He is near the brokenhearted (Psalm 34:18). In lieu of allowing worry to consume me, I began to cast my cares on the Lord, knowing that He cares for me more than I can imagine (1 Peter 5:7). Since instituting these practices into my life, I have not experienced a single moment of all-consuming anxiety during any of my husband’s more recent deployments. In fact, I have learned to look forward to deployments as periods of significant spiritual growth, but that is another post altogether. I replaced worry with trust. In God I trust, I shall not be afraid. Will you join me? Together, let’s commit to trusting God so that the enemy cannot steal one more second of the peace that surpasses all understanding (Philippians 4:7). For more resources with a Biblical perspective on overcoming anxiety, visit my friend Julie Loo at Unmasking the Mess. For more encouragement please join the discussions on these fabulous blog link ups – Suzanne Eller, Thought Provoking Thursday, Susan B. Mead, Faith Filled Friday, Grace and Truth, Faith and Fellowship Friday, Grace and Truth Friday, Good Morning Monday, Soul Survival, Monday Musings, Rah Rah Link Up, Tell His Story, Woman to Woman Wednesday, Women With Intention Wednesday, Sitting Among Friends, Word of God Speak, Testimony Tuesday. I know exactly where you are coming from on this. I was in the service too. I know what is like to lose the one you love yet through it all God was there in big and small ways. Really, Patricia! How did we not talk about this in Denham Springs? He is there through it all!! Thanks for another post that’s full of God’s truth. I hope you’ll come link up sometime on Mondays @ Soul Survival. I’m visiting today from “Spiritual Sundays.” Blessings! Thanks, Donna. I’m there every Monday morning! Thank you for hosting such a fun link up! Blessings to you! Military deployments are difficult times for the family members at home. I have 2 sons in the army who have deployed multiple times, and their marriages did not survive. I pray for their new marriages to last. 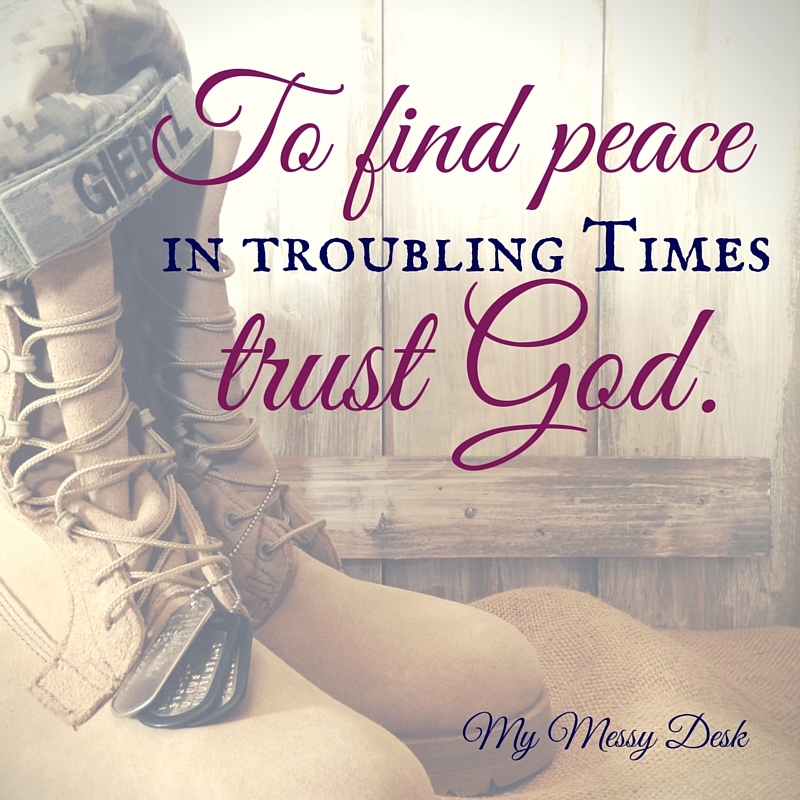 I am so glad to read that you have found that trust in God makes the deployments less anxious, and can actually be a time of spiritual growth. This is so encouraging! I pray that my daughter-in-laws can find this same trust and peace. I am visiting here from Spiritual Sundays. Thank you for making the sacrifices and persevering in your commitment to be part of a military family. You are a soldier yourself! And thanks for reminding me that no matter how big my fear, God is bigger. I worked for the military for years and watched our Commanders deploy and prayed for their safety. I was one back home providing all the things needed working for the DoD. I can’t imagine what you went thru or all my very good friends who grew up military brats and married military. I believe I’ve written the same post…worry to trust. So glad you are overcoming. It’s a process for sure! #44 at Jennifer’s, and returning the visit! Peace that replaces anxiety – such a deep, consuming need for so many of us. Anxiety is an ugly thing. It can rob us of our joy. What a great post! Our relationship with our Savior is the key. Relying on Him for that peace that passes understanding – yes! Are You Seeking Evaluation or Validation?